Even after eight years, the events of September 11, 2001, remain fresh in the minds of all Americans. We are certainly still reflective of the sacrifices made by the public safety workers and others who rushed toward danger that day, and of the sacrifices members of the nation's armed forces continue to make in Iraq and Afghanistan to help keep them safe and us Free. Alto Bonito Elementary honored local heroes in a short program. They had a moment of silence and rang bells at the time each plane hit the Towers, The Pentagon and in Somerset County, Pennsylvania. Mrs. Maria Bazan’s Kinder Class sang “This Land is Your Land”, Mrs. Sandra Sanchez’ 2nd Grade Class sang, “It’s a Grand Ole Flag”, and Mrs. Cindy Solis’ 4th Grade Class sang a song entitled “We Remember”. The Event was a great success and we would like to Thank everyone that took part in organizing it. Most importantly we would like to Send out a Great Special Thank You to the local Heroes that attended this celebrated event. 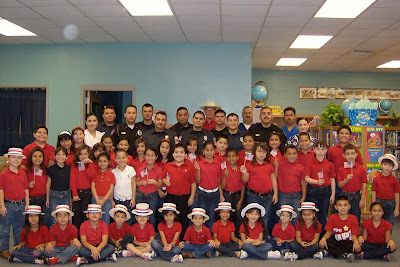 Pictured above are: Mrs. Bazan’s Kinder Class, Mrs. Sandra Sanchez’ 2nd Grade Class, Mrs. Cindy Solis’ 4th Grade Class, and our Local Heroes: Lilliana Zarate, RN, Edith Hernandez, LVN, Edel Cadena, LVN, Santiago Zarate, Constable, Robert Benavidez, School Nurse, Armando Acevedo, Fire Fighter, Jose Guerra, Jr., Fire Fighter, Pedro Morin, Fire Fighter, Juan Cisnero, Fire Fighter, Sergio Contreras, Fire Fighter, Ricardo Trevino, La Grulla Police Dept., Rolando Rangel, La Grulla Police Dept., Desi Olivares, La Grulla Police Dept, and Gilbert Garcia, La Grulla Police Dept.